It is highly recommended to sign up for the web course as well as weekly/ biweekly tutoring sessions until your test date. The web course will consist of practice questions that are similar to the ones you will see on the actual test. It will also help you quickly learn the most important topics as well as help you pin point your weaker areas which you then can review with your tutor. Tutoring will not only hold you accountable and but will also increase your critical thinking so that you can get more answers right. Worksheets on pediatric development, SCI, ACL, Hands. Wheelchair, & Rancho, etc. What is your occupational therapy test web course refund policy? Your satisfaction is extremely important to us. If you are not satisfied with our program, please notify us within 48 hours after signing up for a full membership, and we will gladly refund your money. So far, we have had very few people ask for a refund. In fact, many of our students can’t believe how good our practice tests and practice questions are. What happens during a tutoring call? Our tutoring calls are client centered and will help you with any areas of the occupational therapy test that you may be having difficulties with. We specialize in helping students increase their critical thinking, dissecting questions, and explaining difficult material. How many individuals attend the session? The tutoring sessions are 1 on 1, therefore it is just you and the tutor on the call. However, we do offer group tutoring sessions if you would like to work with a study partner. What would be gained from 7 sessions vs. 1? The key to our success is making sure you know the most important topics on the occupational therapy test. We developed a 7 week program so that you can focus on a specific subject area each week so that you are an expert by the end of that given week. Working with a tutor each week will ensure that you are a master at that topic and you are ready to move on. In the session, the tutor will answer any questions you have about the topic, go through specific occupational therapy test questions, and quiz you on your knowledge. In each session we aim to strengthen your critical thinking, explain difficult material, and make studying as efficient and effective as possible. Also, why 7 sessions versus for example 8? The program is 7 weeks long, however, many of our students work with us 2 times a week till they take their test. Would this last for 7 weeks or how many sessions can you do per week? We recommend working with a tutor a minimum of once a week until the date of your occupational therapy test. Many of our students highly benefit from working with us 2 or 3 times a week as well. Does the instructor provide homework? The tutor will provide you with a study schedule and what areas to concentrate on. Our sessions are client centered so after the tutor understands your specific needs, they will assign you with tasks to complete, to help you pass the NBCOT® exam. Would I be able to email my tutor prior to beginning the sessions to inform her about my current progress in preparing for the NBCOT® exam? Yes, you can certainly email the tutor prior to the session to ensure progress. We also highly recommend keeping a running log throughout the week so that you don’t forget any questions. Since all of our tutors work full time and have other tutoring clients, we try to encourage that all questions be answered during the tutoring sessions. What is your passing rate? How long are the sessions? What is the cost? Students who use our exam prep web course and work with a tutor each week before test date will drastically increase their chances of the passing the exam. Each session is 1 hour. The cost is $65 for one session or $441 for 7 sessions ($63 a session). What browser is best for our test prep web course? It is recommended that you use Google Chrome or Mozilla Firefox. You can use Internet Explorer, but it will at times have glitches. How to use your website with my Ipad? Download google chrome from app store. Safari does now work well with audio plugin. When you sign in, enable cookies. Select the week you want. The quizzes are not loading. What should I do? Our program is not endorsed or affiliated with The National Board for Certification in Occupational Therapy, NBCOT®. NBCOT® is a registered trademark owned by The National Board For Certification in Occupational Therapy. 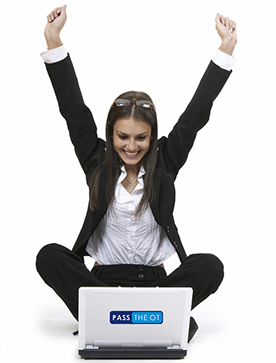 Pass the OT LLC is independently owned and operated.